Izentis is currently fabricating prototypes of the breakthrough critical-angle transmission (CAT) grating for the MIT Space Nanotechnology Lab. It is being developed to improve both the efficiency and resolution of space-based soft x-ray spectrometers. The CAT grating is a hybrid design between a blazed reflection grating and a transmission grating. Suppose the mirrors in a blazed reflection grating would be arranged to be vertically separated; however, still at the same angle with respect to the incoming light. 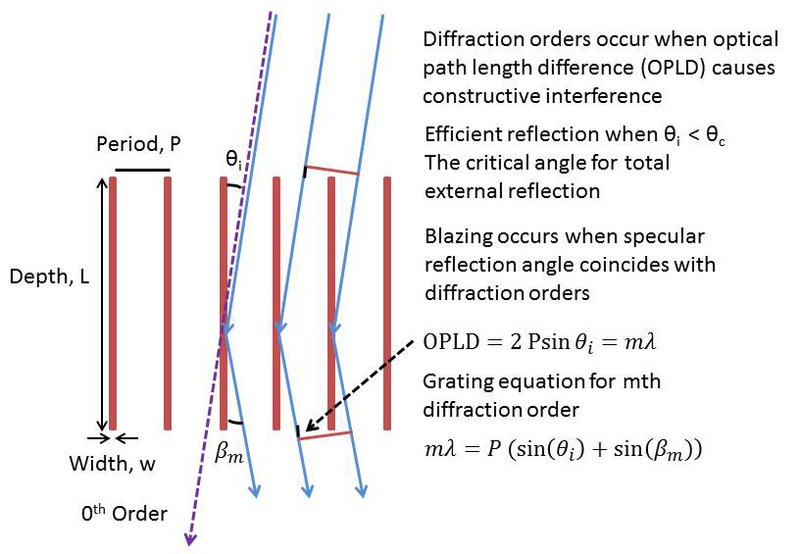 Constructive interference can occur at the specular reflection angle if the angles of incidence, grating mirrors and grating period are arranged correctly. 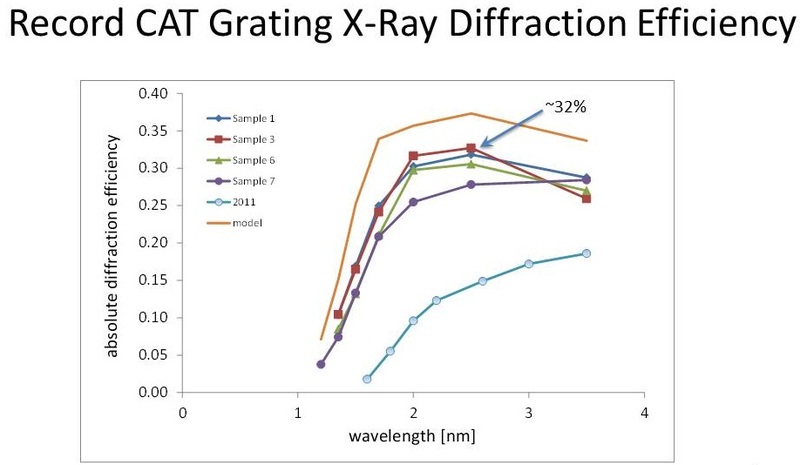 The CAT grating boosts efficiency for two reasons: the incoming x-rays are mostly reflected below the critical-angle for total external reflection instead of being partially absorbed through the grating sidewalls, and the majority of the x-rays are directed into the negative non-zero diffraction orders via blazing. The CAT grating is currently under development and is owned by MIT; however, other high-aspect ratio structures can be fabricated on a custom basis. Please contact us for more information and quotes on high-aspect ratio gratings. See images below of the initial prototype Izentis fabricated. A plot of preliminary soft x-ray diffraction efficiency results is included as well. They were taken by Dr. Ralf Heilmann at the Center for X-Ray Optics at Lawrence Berkeley National Laboratory. Conceptual geometric drawing of a CAT grating. 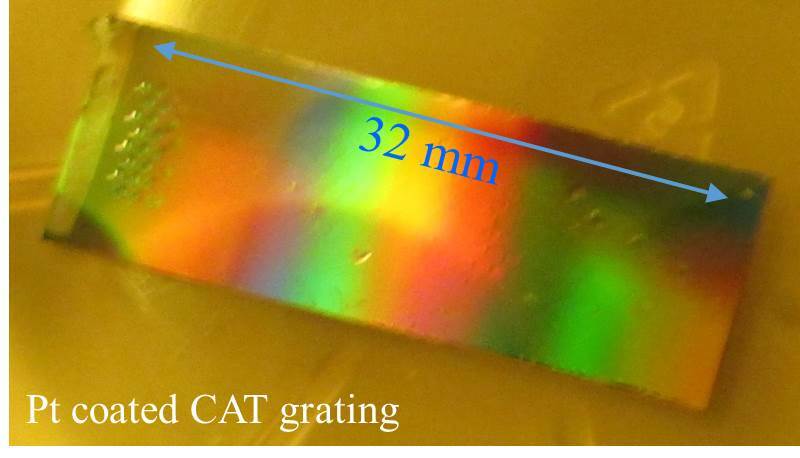 Photography of freestanding CAT gratings with optical diffraction visible from the 5 µm-pitch level 1 support structure. 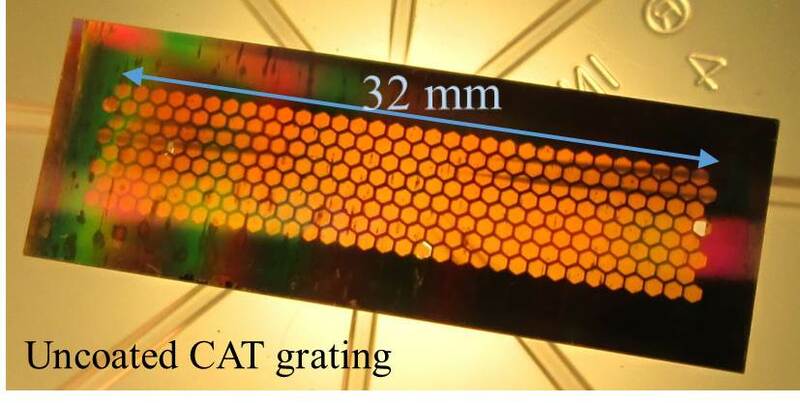 The orange colored hexagons are the freestanding CAT grating membranes. Image Credits: Dr. Ralf Heilmann, MIT SNL. 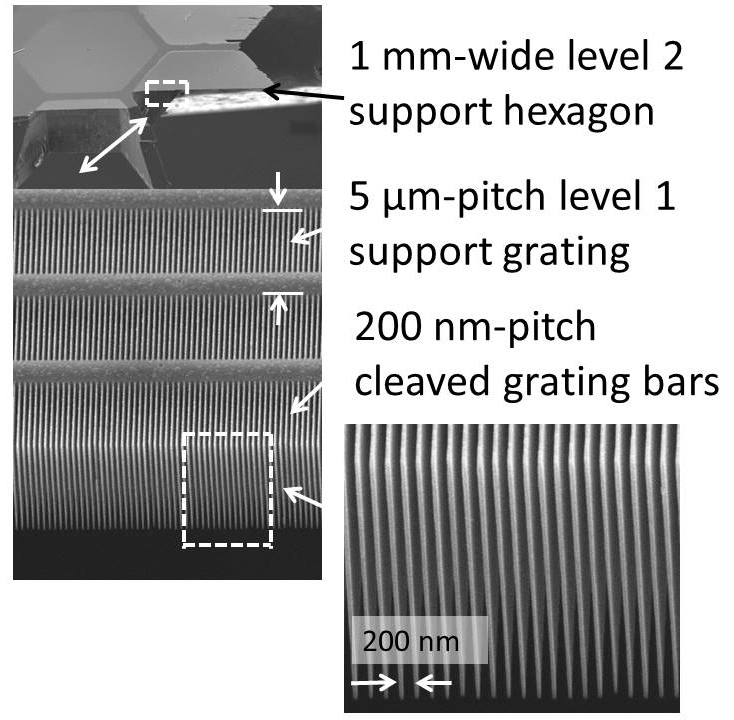 Scanning electron micrograph of the CAT grating membrane with zoomed-in images of the individual grating bars. Scanning electron micrograph of a CAT grating bar sidewall. 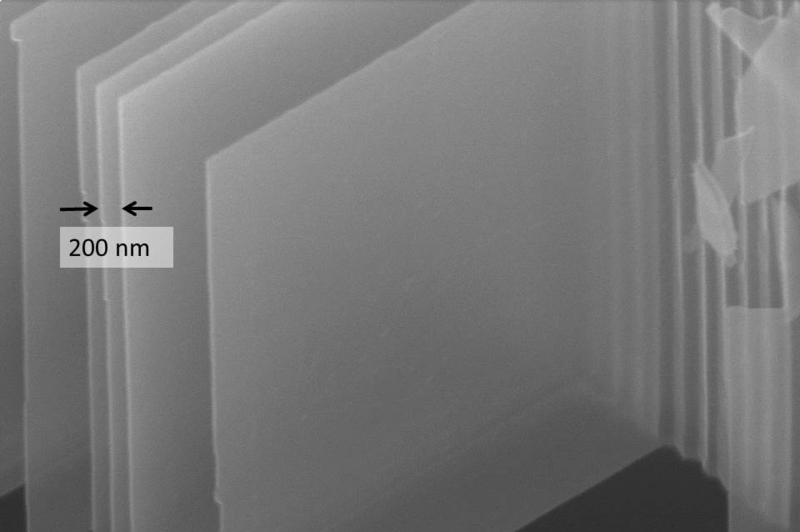 Observe the ultra-smooth sidewalls required for efficient x-ray reflection. Absolute diffraction efficiency of the strongest blazed peak as a function of wavelength, including 20% absorption losses by level 1 cross supports. Plot Credit: Dr. Ralf Heilmann, MIT SNL. The red, blue, green and purple lines are from CAT grating prototypes fabricated by Izentis. 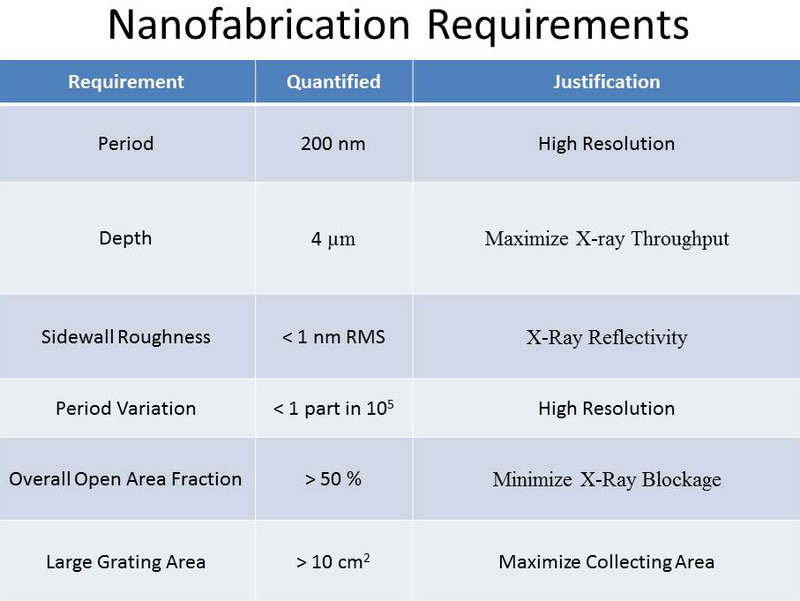 The light blue line is from a previous generation of CAT gratings fabricated by the SNL that were not deep reactive-ion etched. Copyright © 2013-2018 Izentis LLC. All Rights Reserved.